A dish sure to put a smile on your family. A delicious chicken dinner with vegetables and rice that puts a smile on Grandpa's face. 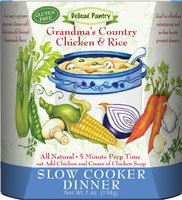 All natural gourmet slow cooker dinners and soups. These delicious meals are easy to prepare, taking 5 to 8 minutes of prep time in the morning, creating fabulous and hearty gourmet dinners to serve your family in the evening. With old fashioned homemade flavor these meals will please the entire family. Dehydrated Vegetables (Carrots, Corn, Onion, Peas, Celery).